Homemade Whole Wheat Sandwich Bread | Live. Learn. Love. Eat. I love homemade bread! For the past few years I had always made my own bread that was more like a giant bun that I would just lay onto a baking sheet. Often times I even made my whole wheat bun recipe but just left it as one giant bun that we could cut (my lazy mom shortcut). We enjoy that bread most often with soup or with margarine and jam. I had never before made a sandwich loaf that we could actually slice and use for toast or sandwiches. For that, we would always just buy a loaf of whole grain bread from the store. Making my own bread is something that I’ve really wanted to be able to do. The loaves at the store are ridiculously expensive and many contain soy or canola oil (which we are trying to avoid now). I knew that making my own homemade bread would be much cheaper and healthier, so on the weekend I got right to making my own whole wheat sandwich bread recipe. With a little love and patience, the result was this beautiful loaf. This loaf is proof that everything is better homemade! 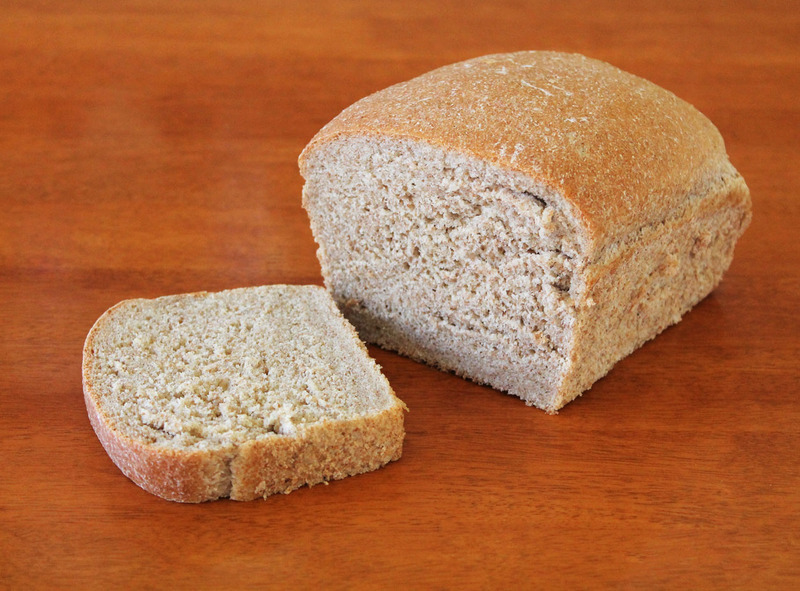 A low-fat whole wheat bread with a high rise that is perfect for slicing and toasting or using to make sandwiches. On the days that I decide to make a loaf of bread, I usually go ahead and double the recipe to have one to freeze and eat later on. Pour the water into a large mixing bowl, sprinkle on the yeast and add the maple syrup. Stir to combine then let sit 5-10 minutes, until foamy. Add 2 1/2 cups of the flour, 1/2 cup at a time, stirring with a wooden spoon, until smooth. Cover and let rise for 30 minutes. Once the dough has doubled in size, add the oil and sea salt and stir to combine. Add 2 1/4 cups more flour, a little bit at a time, stirring until the flour is combined and the dough is no longer sticky. Sprinkle the remaining 1/4 cup of flour out onto a large clean surface. Turn the dough out onto the floured surface and knead for 8-10 minutes, until smooth. Place the dough into a large oiled bowl and turn to coat. Cover and let rise for 1 hour, until doubled in size. After the dough has risen, punch it down and knead it a few times to release any air bubbles. Shape the dough into an oval shape. Place the dough into a 9 x 5 loaf pan, cover and let rise another 25 minutes. Preheat the oven to 350°F during the last 10 minutes of the rising time. Bake the loaf for 45-50 minutes, until golden brown. Allow to cool a while before removing from the pan. 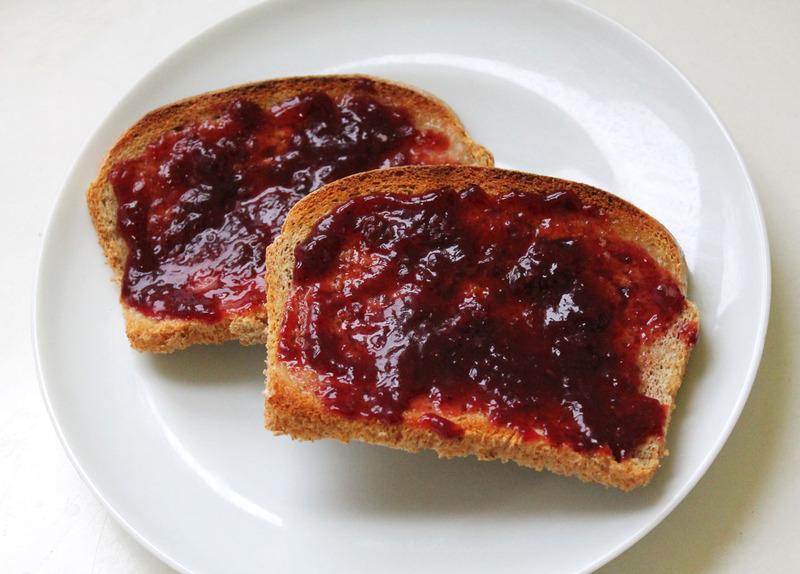 Now we are enjoying delicious toast and jam for breakfast on these chilly fall mornings! Yesterday I made two more loaves of this bread and froze them as well too, just to make sure that the recipe was perfect for sharing on the blog. Now that I’ve made my own bread a few times, I anticipate trying out other whole grain flours to make different types of sandwich bread. Homemade bread is hands down one of the best creations EVER! YUM! me and Miss4 just made some this week. It was my first try in this new oven and first go making it together. So kept it simple. Such fun too. Our next batch will be wholemeal. I need tins to get the slicing type! A grand & tasty home-made bread recipe! Yum! Pingback: Homemade Natural Peanut Butter | Live. Learn. Love. Eat. This looks perfect, I have to try it soon ! I really wanted to make this recipe but for some reason the yeast won’t foam as much as it should. When it gets to the part where it supposed to foam it foams a little bit and theirs always mostly water. I even went out and bought a food thermometer because I read that the water should be between 100 and 110 degrees and that didn’t work. Please, Is their any advise that you could give me. Maybe theirs something else I could be doing wrong. Water should be at about 115 degrees. You have an interesting collection of recipes which you are doing from scratch and going vegan.You have mentioned the yeast measurement as 1 tsp for 5 cups of whole wheat flour.Could you make it clear whether it is 1 tsp or 1 tbsp. Hi…I tried your recipe for the first time today. I’m experienced in making white breads (quick and with yeast), but a complete novice at wheat. 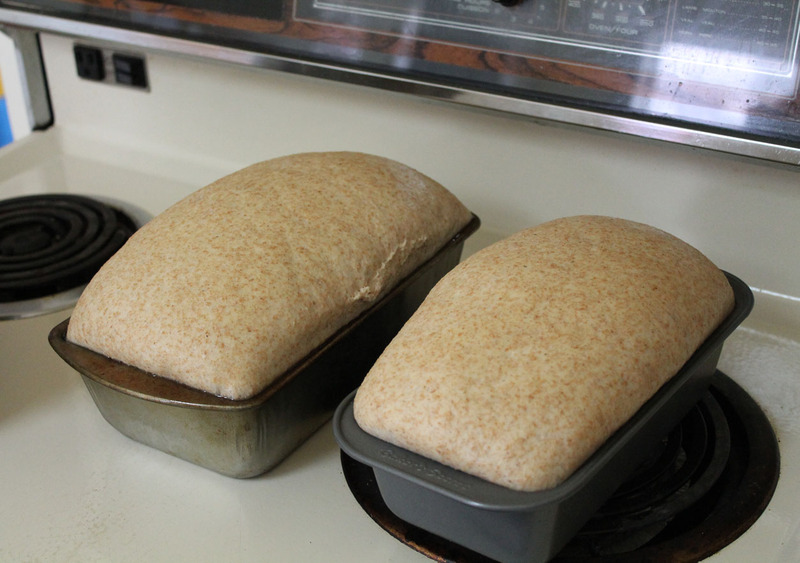 After baking, I’m finding the top of the loaf to be a bit….hard. 🙂 The sides are a good texture, and as it is currently cooling, I can’t test the texture inside yet. Can you help with any tips on how to make the top softer the next time? Thanks! Hi! After it comes out of the oven, rub it with some margarine to soften it or place the loaf in a container or plastic bag once it is cooled a bit, but now room temperature. Hope that helps you! Thanks Tiffany… this was my first bread recipe that came out actually fluffy and so wonderful. Your instructions are perfect 🙂 MMMMMMmmmm so delicious! Can I use coconut oil instead or olive oil? I have never used coconut oil in any of my baking, but if it is just like any other oil, then I don’t see why not. I am so excited to find this recipe. I have made whole wheat bread for several years now, but I have never found an easy recipe that really rises well, without additional ingredients such as gluten or lecithin.. I cannot wait to try this one. Even though I have a mixer, I usually end up mixing by hand anyway, so this recipe should fall right in line with that. I just got ridiculously excited to make this and homemade peanut butter! I’ve finally got my hands on a food processor! SQUEAL!!! I just made a version of this I omitted the maple syrup and used wholemeal organic spelt and it worked a TREAT! Although, I’ve already eaten half the loaf…. aaargh! I have been reluctant to try your recipe in my Zojirushi bread machine but haven’t settled on a whole wheat recipe that I am satisfied with yet. I took the chance and threw your recipe in the maker today and…PERFECTION! I was truly amazed at how perfect the loaf came out. Thanks for sharing!!!! Glad to hear it! 🙂 Love homemade bread! I made the peanutbutter now going to make this bread. Thank you.